Wakfu Asia, Eliotrope, New Character Created - KABALYERO - PLAY, BLOG & EARN! Wakfu Asia, I created a new character and it's an Eliotrope which is a new class in the game. Wakfu Asia is the asian version or server of Wakfu and, recently, I created a new character which is an Eliotrope. The Eliotrope is a new class in Wakfu and it was only released this month. This new class was accidentally created by the God King and I believe that God King was Yugo. If you have seen the animation series of Wakfu then you'll know that the main character, Yugo, is an Eliatrope and I believe he is the last of his kind but don't quote me on that because I could be wrong. From what I know, the Eliatrope race is an ancient race that knows the secret of Wakfu. What this secret is, I have no idea. The Eliotropes also know what this secret is because they're basically the same as the Eliatropes except for very few minor differences. 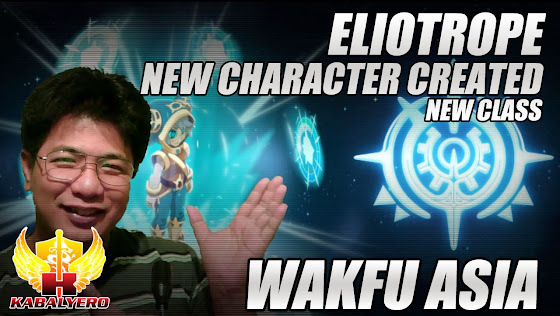 Anyway, you can check out my new Eliotrope character by watching Episode 8 of my Wakfu Asia gameplay video series. Click this link to watch it in YouTube.